Need to tidy up your home office? 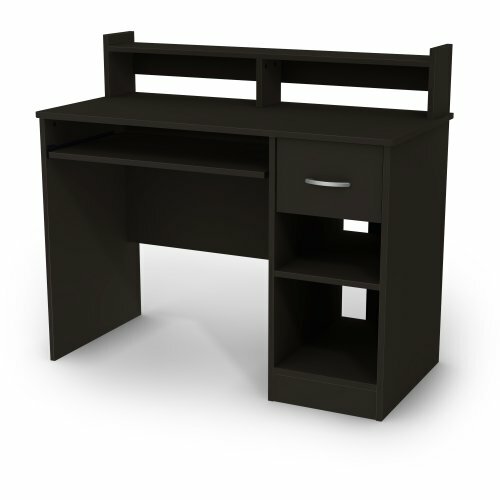 This Axess collection desk is perfect for all your storage needs! Its compact design includes all the space you need for a well-organized workspace thanks to its open and closed storage spaces. In addition, the work surface is great for laying out homework or setting down a laptop. With its neutral and trendy finish, this desk will match any decor perfectly. Metal handles in Pewter finish. Features 2 open storage spaces divided by 1 adjustable shelf that can support up to 15 lb. Cut out hole in the back panel which allows for easy wire management. Features one practical drawer. Metal slides on keyboard tray for a smooth gliding. Metal drawer slides. Drawer dimensions #1: 9.5'' (L) x 13.5'' (D) x 4.25'' (H). Shelf #1 dimensions: 9.5'' (L) x 20'' (D). Shelf #2 dimensions: 27.5'' (L) x 20'' (D). Accessories not included. Requires complete assembly by 2 adults (tools not included). 42'' (W) x 20'' (D) x 36.75'' (H). Box dimensions: 49.75'' (L) x 21'' (W) x 5.25'' (H), 81 lb. Packaging tested and certified to reduce the risk of damage during shipment. Made in North America with non-toxic laminated particleboard. 5-year quality guarantee. Any questions? Contact South Shore, the manufacturer, available 7/7 by phone, email or chat.